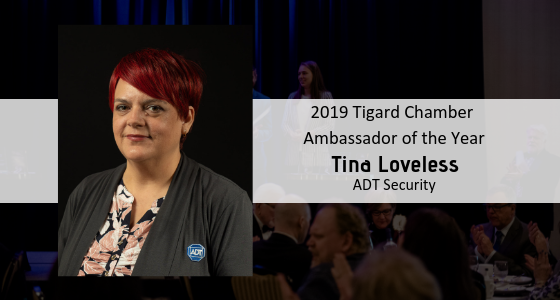 Tina Loveless, District Representative for ADT Security has been named the 2019 Tigard Chamber Ambassador of the Year. The Ambassador of the Year Awardis presented to an Ambassador volunteer who significantly affects a positive perception of the Chamber through active participation, an optimistic attitude and solid business practices. The recipient is active, involved, interested, and enthusiastic about making the Tigard Chamber a great organization! The Tigard Chamber Ambassadors are a volunteer group of chamber members who manage weekly a.m. networking, Speed Networking and Holiday Happy Hour. They extend the capabilities of the chamber to deliver services to members in addition to paid staff. Without the Ambassadors, the chamber could not have the impact it does for its members. When Tina joined the chamber, this enthusiastic member was quickly recognized as a dedicated individual possessing the qualities the chamber embraces. Tina has been an Ambassador for about a year and a half. She is always willing to step up to take on a role at Good Morning Tigard or assist a fellow Ambassador. She has been a table sponsor at Speed Networking. She has also played a huge role with collecting raffle prizes and volunteering at the Holiday Happy Hour. Other Ambassadors on the team describe her as a real go getter, enthusiastic and true leader.